“Public use of the library meeting room is subject to availability and compliance with the terms of the Meeting Room Policy as outlined in the link below. When the meeting room is not being used by the library or library-sponsored or co-sponsored events, the space will be made available to the public on equal terms regardless of the beliefs or affiliations of individuals or groups requesting their use. The meeting room is to be used for general information, educational, cultural and civic needs, including activities such as discussion groups, panels, forums, lectures, conferences, seminars, and meetings. The library meeting room is intended to host organized meetings and is not available for party-type functions. 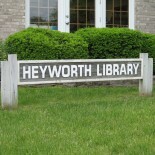 To request availability of the meeting room, please print and fill out the last page of the Meeting Room Policy and return the form to the library or send it to Beth Porter via email at questions@heyworthlibrary.com. To check the availability of a specific date and time, a request can be made by filling out the contact form below.